This is the view from Sutton Bank which is a very steep escarpment separating the North York Moors from the Vale of York and the Vale of Mowbray which you can see in this sketch. The Pennines can be seen some 40 miles away in the very far distance. I had a lovely sunny day to do the sketch but the seat on which I sat to draw Hood Hill (or "one tree hill") and the vales was so exposed and 'breezy' that I was really glad I'd taken a layered approach to dressing for plein air sketching - all five of them! This sketch was a bit of challenge in terms of how many greens in the landscape and aerial perspective blues I could get with the coloured pencils I had with me. A 'killer hill' with a narrow road leads up to this view. There are lots of signs threatening awful things to caravans (which are strictly prohibited from attempting the climb) and warning HGVs about many broke down last year when they didn't follow the advice to select their crawler gear! I did it for the first time after my warning light came on to say the antilock braking system has been disconnected - for no obvious reason - so it was a bit intimidating to say the least! If you go the other side of the road and walk along there's a wonderful view of Gormire Lake - which, I understand fills a bowl left by glacial action and is one of the only two lakes in Yorkshire. Personally I thought its name made it sound like it was auditioning to be in a new novel by an author with a prediliction for 'interesting' names. It certainly had a somewhat eerie quality to it given the way in which the dense woodland surrounded it and I didn't feel an overwhelming need to visit. Near the foot of the escarpment is the town of Thirsk where the real James Herriot (Alf Wight) had his vetinerary practice at 23 Kirkgate with his partner 'Siegfried Farnon'. Thirsk (along with a few other towns) provided the basis for 'Darrowby' in the books. Walking his dog on the top of Sutton Bank was apparently a favourite occupation whenever time permitted. The quotation comes from a book called "James Herriot's Yorkshire" which was given to my father complete with autographs from the three real people behind the 'characters' in the very popular vet series after he rescued my friend 'A' (daughter of 'Tristan' and midwife to the birth of my first cat) and me from another car calamity on our way up north on an extremely hot day some 25 years ago. For those interested in Yorkshire, the book has some great photos by Derry Brabbs (who also did the photos for some of Wainwright's Books of the Lakes). Fans of the James Herriot series can now also visit the house at 23 Kirkgate which was home to the real vetinerary practice and was 'reproduced' in the BBC series as it's now home to a museum about the world of James Herriot and vetinerary science. Sutton Bank is part of the Hambleton Hills at the very western edge of the North York Moors and National Park. It's also known as Roulston Scar. It's bisected by the road between Thirsk and Scarborough which follows the southern edge of the Moors . It's also home to the Yorkshire Gliding Club and the White Horse of Kilburn which lacks some of the artistic merit of the White Horse of Uffington but none of the impact. 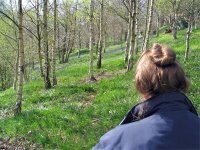 The North Yorks National Park - and their very helpful staff - have a home in the trees just as you get to the top of the hill with car parking for the Park's very many visitors. 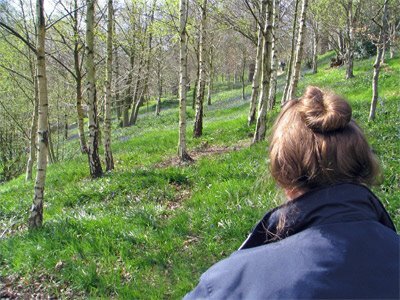 There are five walks into the area around Sutton Bank which start from the car park. The Moors Bus Service (April-October) also picks up people from and deposits them back at the car park. [10th June 2007: Revised/Updated ] This summary post will be updated as blog posts are posted to this blog. Staffordshire: Drawing people and delaying the cream tea (13th April 2006) - a visit to Biddulph Grange Gardens - and its tea room. Cheshire: Sketches from Tatton Park (18th April 2006) - two double page sketches of scenes from this 50 acre garden set in a 1,000 acre deer park. Both of the above posts on this blog now include links to the places mentioned in the blog post. Cheshire: Early Morning Light in Cheshire (1st November 2007) - sketching the views and the early morning light - including a sunrise - from windows in my cousin's home. 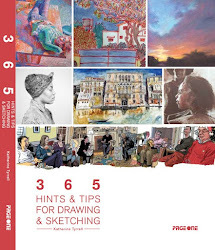 A link to this summary post is inserted into the "Travels with my sketchbook in...." section in the right hand column (which groups together all summary posts). 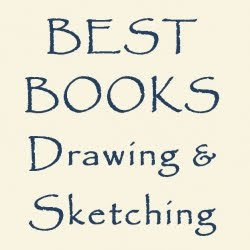 What do I do when I get home from sketching my way round the south western states of the USA? I sketch! "He who must not be bored while I sketch" was in very chatty mode while we drove down to his favourite view at Emmetts Garden in Kent. 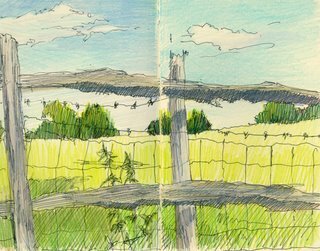 I sketched the view to the rear of us while we sat on a bench looking at the Weald and idly speculating about which country has the best weather in the world. Well it was a walm and balmy summer's day in Kent - and we decided that Kent was really pretty good! 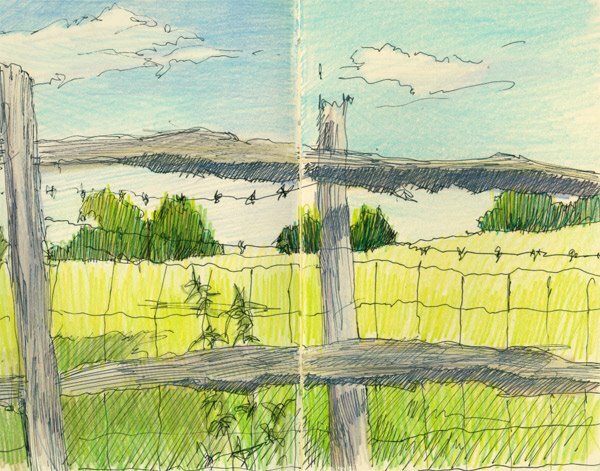 Isn't it weird that even with a sketch which features an "in your face" fence, barbed wire, a chain mesh fence and nettles that it still looks really peaceful! 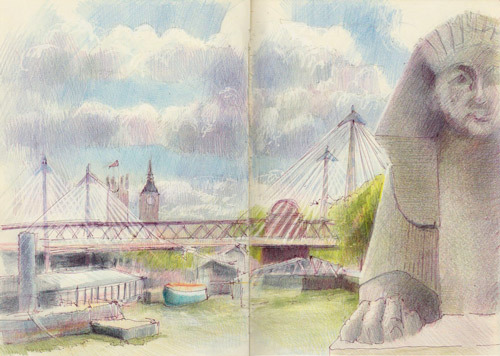 This sketch is in my new small Moleskine which I'm going to try and use a bit more. That means that this image is only 7" x 5.5" across a double page spread. It was done 'en plein air' in pen and ink and then I used coloured pencils when I got home. Just to clarify: Odd - as in "intermittent" - sketches will continue to be posted on this site. Only sketches associated with trips and travelling will go on my new new blog - and they have now started - first sketches were posted today! Yesterday the sun shone - and we went to Chartwell in Kent, former home of Winston Churchill and now a National Trust property. 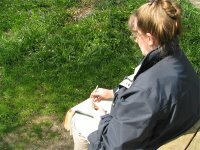 I went armed with camera and sketchbook and my partner went with the intention of doing one of the things he enjoys doing best - sitting in the sunshine with a marvellous view of the Weald of Kent. 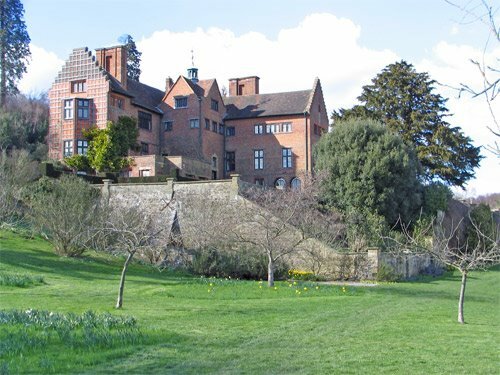 After a quick visit to the house (again - we go every year at least once, partner is a big history buff) and some negotiation as to which bench in the garden meant he got the best dose of sunshine on his face and gave me the best view(! 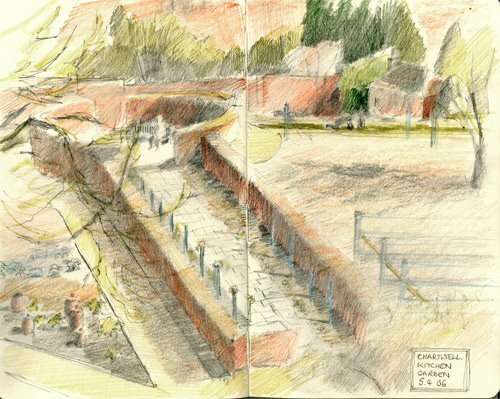 ), I settled down to sketch the kitchen garden from a terrace just above it. 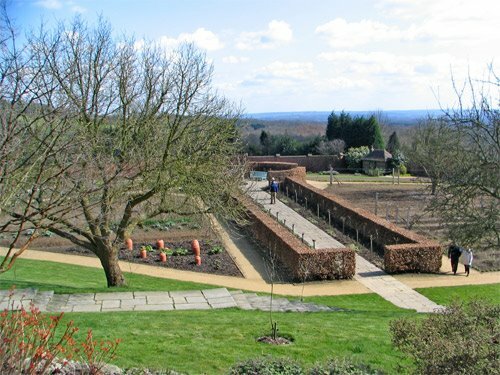 Churchill himself built the brick walls in the background of this kitchen garden. 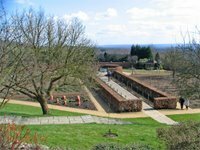 There's more information about the recent restoration of the kitchen garden here. 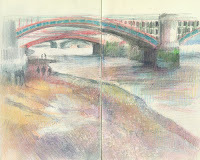 The sketch was completed using a mechanical pencil in a double page spread of my Moleskine sketchbook and I used coloured pencil on top to give a sense of the main colours. I think I'd like to have a go at doing a landscape painting from the terrace we sat on as the bit you can't see is the stunning view of the Weald of Kent which is just above the top margin of my sketchbook. I've included some photos - the first is of the view I had (except the photo was taken standing up). One of Churchill's recreations was oil painting. 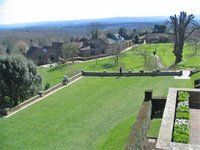 The next is a shot looking down to the studio where Churchill painted and the Weald beyond. The studio is the brick building to the left of centre. The kitchen garden wall is top right. Finally, one taken from the studio area looking back up at the house. This last view is one which I'm doing in pastel for my partner. He's very patient, as it was started on a sunny day a long time ago and has stayed 'nearly' finished for simply ages! It's quite a busy traffic area and I didn't find it easy to paint from there so I'll probably try and finish using this photo as a reference. There's not a lot to do to it. You can see more photos on the National Trust website. 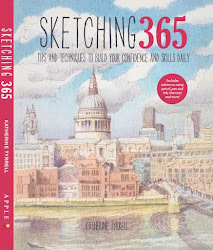 The next section of this blog will feature sketchbook blog posts (from Making a Mark) which are about places in Kent. 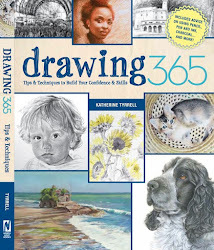 These all include sketches which are drawn in pencil or pen and ink and then completed using coloured pencils. These posts will be posted after this summary and the hyperlink to each post will be added to this summary as each is published. I'll also include a date at the end of each post of when it was first published on 'Making A Mark' but otherwise won't comment further. updated on a monthly basis if I've posted a sketch of Kent in the previous month. 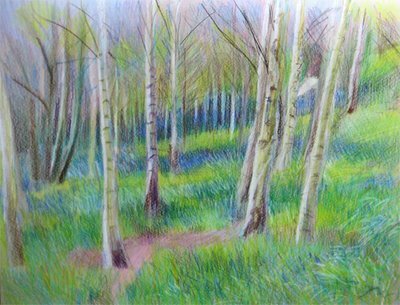 The image at the top of this post is a drawing I completed based on the sketch I did and the photos taken during my visit to Emmetts Garden in Kent last April (see 'Sketching bluebells').